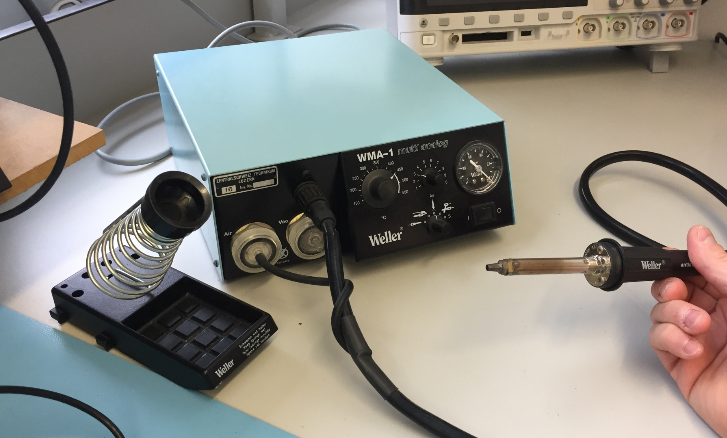 The tinyK20 we have produced at the university for student projects are great: small, inexpensive, can be used for many projects and can be both debugged with normal SWD debuggers and can be even used as a SWD debug probe. However with an NXP K20 (ARM Cortex-M4) running at 50 MHz, 128 KByte of FLASH and 16 KByte of RAM it is are not the most powerful board. So somethinig more powerful would be cool! The tinyK20 has the option of an micro SD card on the bottom side. 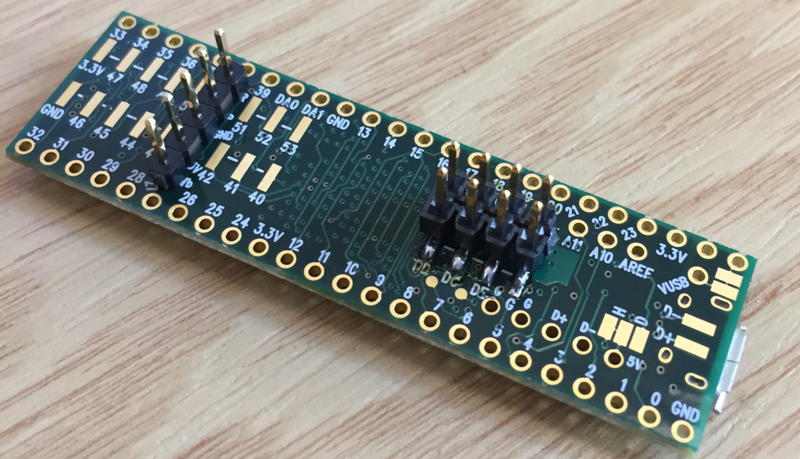 Maybe Paul had the same idea, and Hackaday produced an article (http://hackaday.com/2016/08/17/introducing-the-teensy-3-5-and-3-6/) back in August 2016 about two new boards: the Teensy 3.5 and 3.6. The Teensy boards are great (thanks Paul! ), but only if using Arduino libraries and the Arduino IDE which never has been an option for me. Instead, I want to use normal debugging tools like a J-Link. For the Teensy 3.1 I have found a way to do this (see “Hacking the Teensy V3.1 for SWD Debugging“) and we used that for several Teensy boards. But that wiring was not really easy, so we better used the tinyK20 as boards. Now it seemed that Paul finally has added an easier way to to SWD debugging (several asked for that in the forums/community). So all what I have to do is to connect DE and G and I should be able to debug it, right? So what now? Wait again maybe a year or forever? Luckily, I have found a way, but it is the ‘hard’ way. WARNING: This modifies the Teensy board, and without a doubt you loose any warranty doing that board change! Pulling the reset line LOW to keep the KL02Z in reset does not work, as the reset line is shared between the KL02Z and the MK66F/MK64F. As anyway the KL02Z on the board is not of any use for me, the decision was to remove it from the board. Then heat up the KL02Z until it can be removed. Because it has a bottom ground plate, it might take a while until it can be removed. 💡 If your debug probe does not do any target voltage sensing (as the J-Link does), you don’t need that red Vdd wire. The Reset wire is optional too (but highly recommended), because it is used to reset the target if the processor does not respond on the SWD connection. The Teensy is a great board, and Paul Stoffregen does a really great job. But I really don’t understand why he makes it so hard to use his boards for debugging? 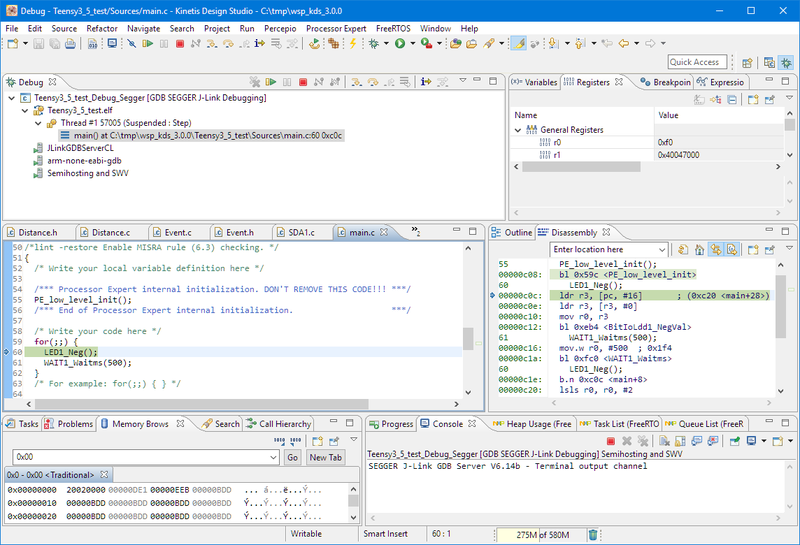 Maybe others are used to printf() style debugging as a hobby, but to me this is not the adequate way how to develop for an ARM Cortex-M. To use normal SWD debugging tools with the Teensy 3.5 and 3.6 it requires a hardware change, as for the Teensy 3.1 (see https://mcuoneclipse.com/2014/08/09/hacking-the-teensy-v3-1-for-swd-debugging/). 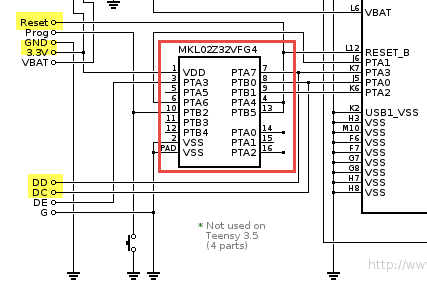 Because the DE (Debug Enable) signal does not work, it requires removal of the KL02Z microprocessor from the board. And because the board does not allow the standard SWD debug header, I have to create a custom cable. It works fine, but is not ideal. I really wish Paul would have provided a normal 2×5 SWD debug header or footprint (ideally on the top side): that would make his boards even more useful. This entry was posted in ARM, Boards, Cortex, CPU's, Debugging, Embedded, Kinetis, NXP, Teensy, Tips & Tricks and tagged ARM, Debug, Debugging, Flashing, Hackaday, J-Link, Kinetis, KL02Z, NXP, Segger, SWD, technology, Teensy, tinyK20, Tips&Tricks by Erich Styger. Bookmark the permalink. Hey there, you should submit this to hackaday.com. They cover stuff like this all the time and would love it. yes, they do cover such things from time to time. I have posted a response in the PJRC forum to a related questions so Teensy users can find it. overly complicated: I wish the board would enable debugging, then something like this would not be necessary. Reset is low active, so I cannot use a stronger pull-down. And a stronger pull-up would not work if I want to get it pulled down by the JTAG debug probe. Yes, I considered capton tape too, and that would make it even easier, but it worked very well that way for two boards. I’m quite aware RESET is usually low active which is why there’s usually a pull-up in place. I’ve just checked the schematics and this is certainly not the case. 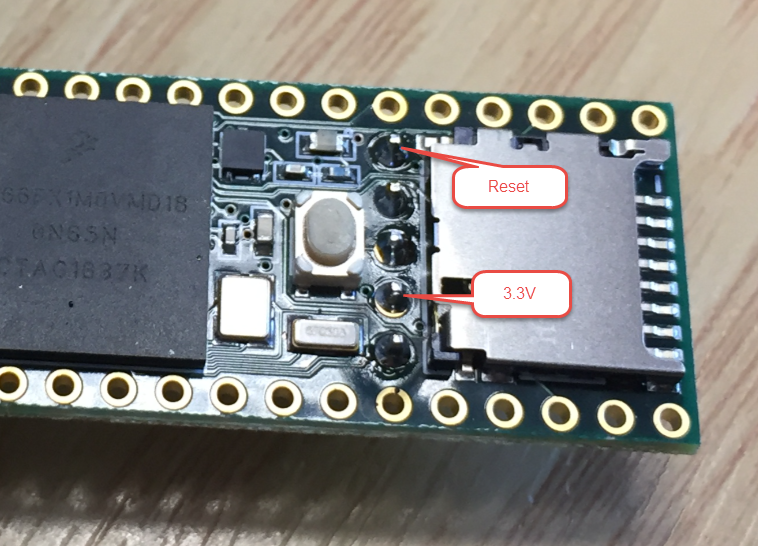 The KL02Z must be actively driving the RESET pin because otherwise it would be floating which is not a good idea und wouldn’t work well. If the software on the KL02Z doesn’t work as intended by not respecting the DE signal that’s quite a pity but I don’t think it would help much anyway because if you disable the active signal from the KL02Z (or set it to open drain) then RESET would be floating without a pull-up somewhere. 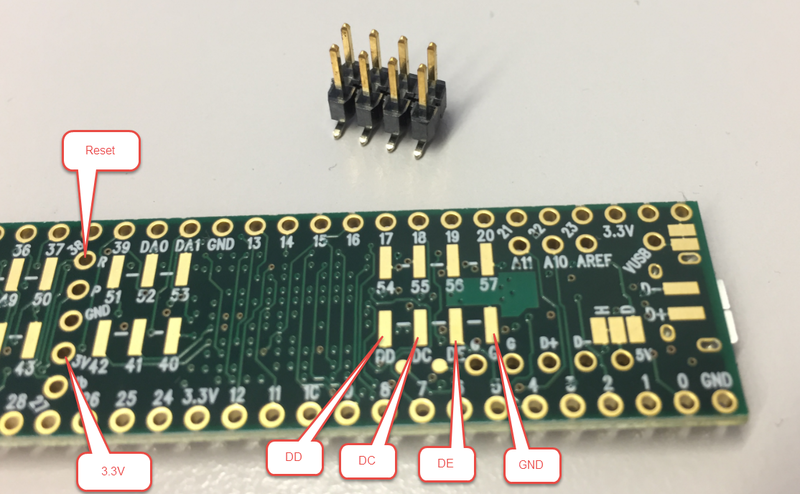 However to achieve this very same effect you don’t need to desolder the KL02Z, simply cutting the power supply at pin 1 and adding the pull-up as you did would do just as fine. Yes, the KL02Z must drive it down, probably it has its internal pull-up enabled too. Cutting the supply to the KL02Z with an added pull-up to the reset line is indeed another option. Has somebody tried removing the power pin from the KL02Z. Won’t the device then be powered through one of the io pin’s protection pins? I have not tried that. It worked best for me to remove the KL02Z as it was of no use for me anyway. is it possible to load the arduino code to kinetis studio? I want to use all arduino libs and to debug the teensy. I’m using Arduino code, yes. But not directly: I copy the code and make small modifications. It is not possible to use the Arduino code directly as you would need a full port of the wiring library which does not exist to my knowledge. But this is not a big deal, I can use basic pin and utility functions instead. i see. i use a lot of the teensy library like CAN-Bus and the ADC and Timer Modules. do you have a small sample project to get some basic knowlage, maybe i am able to convert the visual micro project to kinetis. Best if you use KDS or the MCUXpresso IDE, start with the wizard to create a new project and then add the source files. Many of the projects are using originally some Arduino code or libraries e.g. for sensors. Thanks for sharing, that’s indeed a very good solution too! we tried that approach with pulling downthe KL02Z pin15, but that did not work? Did we miss something? Might just be a bad solder blob, or wrong wiring. that will help, thank you! connecting the reset pin to GND worked for me. But there is another way to get the KLO2C being non-functional. Pin 14 and Pin 16 are SWD_CLK and SWD_DIO of the KLO2C. They are routed to test points on the bottom side. These are much easier to solder. Using an appropriate debug probe (e.g. J-Link) one can erase the contents of the KLO2C. Reading it out before could be a good idea though. That’s actually indeed a good idea! Thank you SO much, Erich! I’ve been looking for a lower-priced K66 board and each time I look at the Teensy, I keep balking because I couldn’t hook up a JLink to it. I understand Paul’s desire to use a bootloader friendly for Arduino users, but I never understood why he couldn’t just include a jumper that allows you to use either the debug port or the Arduino-friendly bootloader. I think Paul’s desire is more about protecting his sales so it cannot easily counterfeit. I understand that desire 100% as he does a great job both on hardware and software. On the same time I think he misses a great opportunity for more sales for his Teensy board. 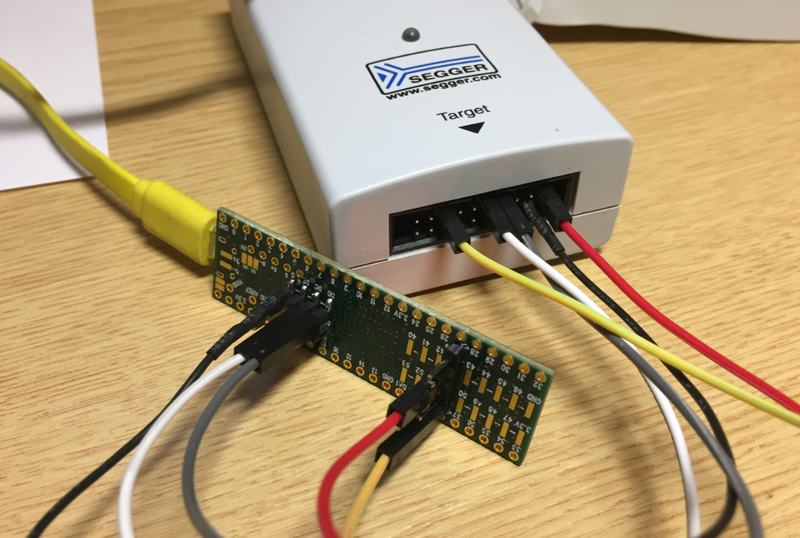 Alone at our university we have produced and used hundreds of tinyK20 (https://mcuoneclipse.com/2015/11/22/data-logger-with-tinyk20-board/) which are basically a Teensy minus that closed teensy bootloader, but have normal SWD/JTAG debug capability. 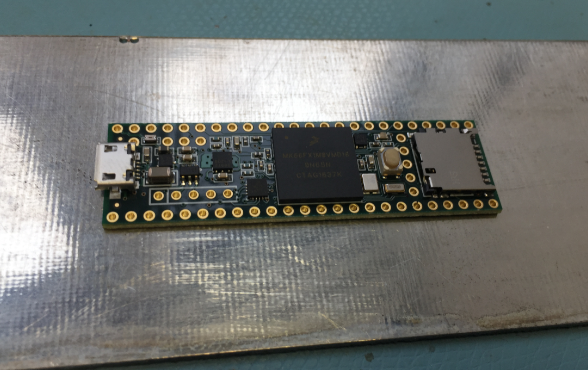 We are usinig the hacked Teensy 3.5/3.6 in several projects, but because that hacking is still painful, we decided to build a new tinyK22 basesd on the Kinetis K22 device with more RAM and FLASH (same device as on the NXP FRDM-K22F). Thanks for these fantastic tutorials! I followed all the steps you described and unfortunately, I cannot connect my Jlink to the MCU. I checked the reset_b pin with the oscilloscope, and apparently, the MCU is constantly resetting. I had a look on this link: https://community.nxp.com/docs/DOC-99609 and they say that it is caused by the watchdog which is in continuous enabled mode the first time you turn ON the MCU. I completed the operation on the Teenzy 3.5 which has never been used before (no Arduino code flashed on it). Should I write some code on the MCU before following the steps of the tutorial? it worked for me with Teensy devices which never have been used with the Arduino IDE (I don’t use that IDE anyway with it). So yes, that reset signal is normal for blank devices, but to me this is not the watchdog, gut the hardfault: the CPU runs, but the reset/vector table is erased with 0xFFFFFFFF, it tries to load this as stack pointer and programm counter, tries to run and then causes a hard fault because the instruction is illegal. 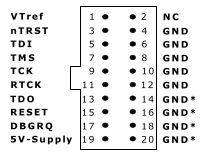 If you have removed the Teensy loader chip, and connected as shown in this article the J-Link signals, you will be able to connect with a J-Link. Maybe you have not correcly connected the signals? I already checked the connections and there is no issue on that side. Actually, the LED of the Jlink is orange when all is powered up, but does not seem to be very stable (oscillating like a star…). J-Link RTT Viewer V6.22 : Logging started. LOG: Protection bytes in flash at addr. 0x400 – 0x40F indicate that readout protection is set. For debugger connection the device needs to be unsecured. Note: Unsecuring will trigger a mass erase of the internal flash. LOG: Executing default behavior previously saved in the registry. LOG: Device will be unsecured now. ERROR: Could not find core in Coresight setupLOG: RTT Viewer connected. Ok, this shows that you are able to to talk to the device with the J-Link :-). So everything is fine. All what you need is now to program your device with a program. Thanks again. So it sounds like I have not completely destroyed my Teenzy ! I will also try with Codewarrior,… , to see if I receive a different message. Don’t waste time with CodeWarrior: it is outdated. Better go with MCUXpresso IDE. Do you have any experience with Teensy 3.6 to upload the firmware over the air like with ESP8266? Thanks! 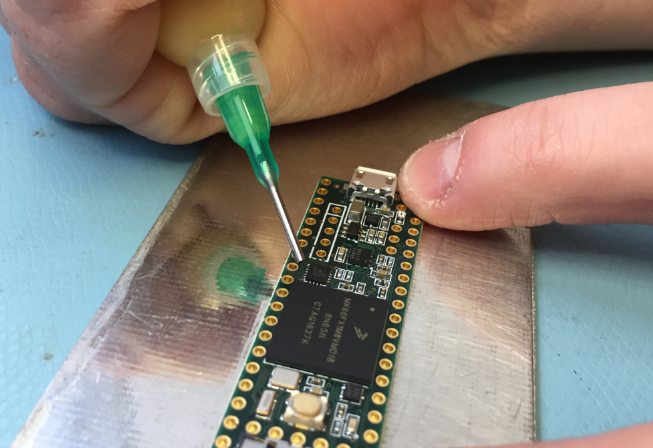 The Teensy board does not any wireless connectivity, so without any transceiver you cannot do any over-the-air update. Hello Erich, Thanks for the quick reply. Yes, I know that thats why I would use ESP8266 connected to it. Or to make it simple, if we have two teensy connected together, and one has the new firmware(hex file) on its SD card. How is it possible to update the OTHER teensy? And then I can implement myself to ESP8266. Many forum topics says it is possible, but no clear explanation about wiring and code. I have looked the teensy cli, and tried to adopt it on esp8266 but did not work. I think not even the wiring is good. Thank you Erich! I will check it! Here is how I soldered to pad 15 of the KL02Z. 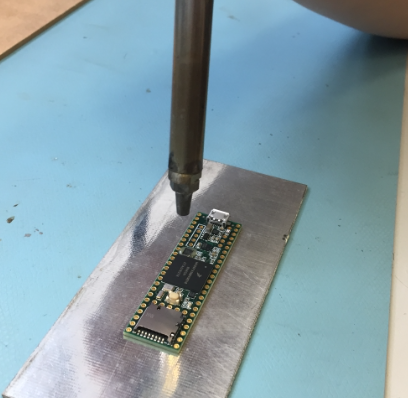 The heat to complete the joint was conducted through the single strand of wire I used to make the connection – so it was not necessary to touch the pad itself with a soldering iron. it also works completely without soldering. The board has two test pins for KL02 programming. It creates a startup project for KL02 with MCUXpresso and configures reset pin as input with pullup. That would be good news. Can you share details on this how this is done? Yes, I can send you a few pictures and the initial project for KL02 by email. If you want, you can also add his inormation to your blog. Otherwise everything is very simple. 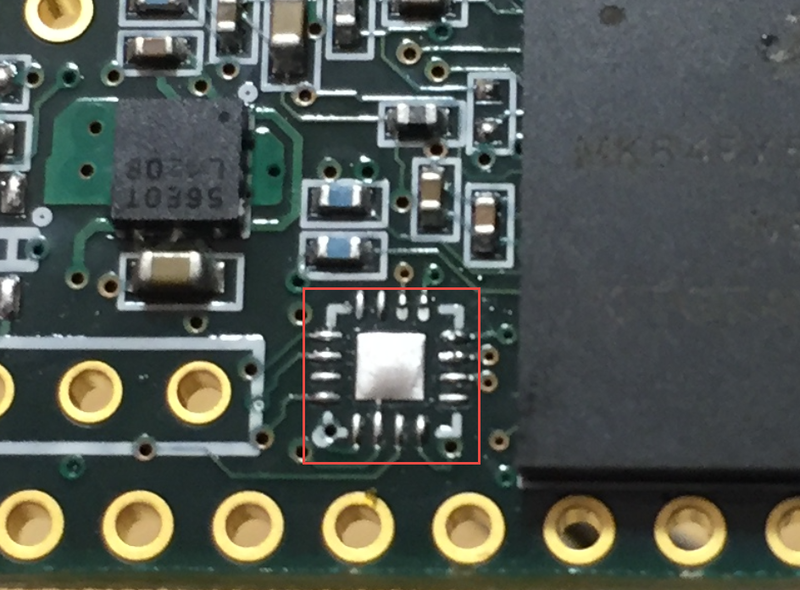 The test pads PTA0 and PTA2 by KL02 are in the near of debug connector, and have 2.54mm RM to the USB host connector. I made a 7-pin adapter. 5 pins are plugged to the USB host just for reference to the 2.54 grid. And the remaining two pins are spring contacts. Then you can flash the KL02. PTA4 and / or PTB5 as input with pull up. Done! I also have a jumper between “Prog” and “Reset”, which allows to use the Prog button as a reset button. There is a standard bootloader provided by NXP in their SDK. The great attraction of the Teensy, for me at least, is that the boot loader programmed into its seriously teensy KL02Z / MKL02 32 bit microcontroller will enable me to create a product with the Teensy which a non-technical user can update the firmware of, via USB. I haven’t got this far yet, but I have used this facility with someone else’s product (Quicksilver 303) designed with a smaller Teensy. I would create the firmware file in a special format and make it available to my customers. I assume this can be done with an executable produced by GCC, since the QS 303 code was all written in C++ with GCC. Then the user runs a program on their PC (Windows, Mac or Linux) which is supplied for free by the Teensy team – the Teensy Loader Application: https://www.pjrc.com/teensy/loader.html, of which there are GUI and CLI versions and FOSS source code. Then the user can update the firmware of the main microcontroller in a minute or two via USB. I would not like to have to create such a system myself, much less test it extensively on multiple operating systems. 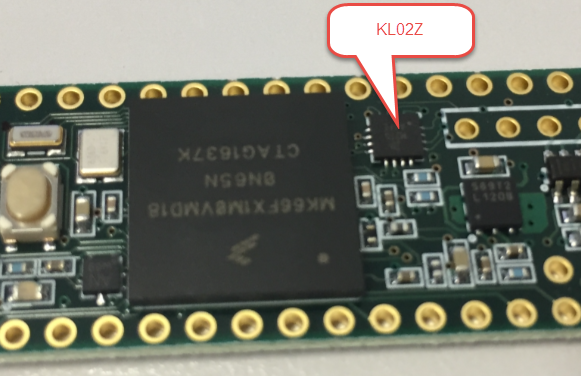 As far as I know, this KL02Z / MKL02 firmware is Teensy proprietary. I don’t know of any other such system of firmware and user programs which has this functionality. Yes, the bootloader on the KL02 is proprietary, and I think it is that way to prevent cloning the teensy hardware. Thanks for the link about the Teensy 4.0 which sounds interesting: such a board would be definitely something cool. It all depends on the quality of the built-in DFU bootloader: they tend to have bugs or do not work well with low power modes or have issues with interrupts. And at the end they are using some internal memory (OTP probably) anyway. Worst case is if the code of such a ROM bootloader is not available. At the end I prefer a good bootloader I can control and have visibility into it. I’m not sure we’re on the same page here. How can they have problems with low power modes or interrupts? Either they work or they don’t and you won’t have any control over their operation anyway. E.g. the STM32 USB DFU bootloaders work a treat and I couldn’t care less about how they’re implemented or how ST provided the required storage. 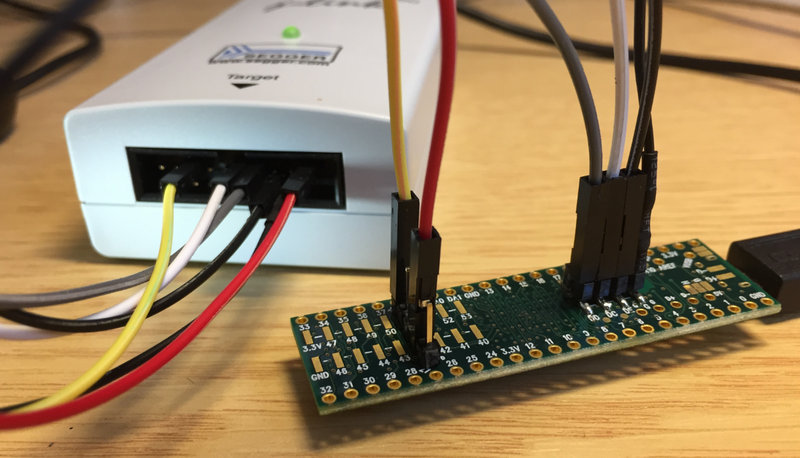 If it has working for your flawlessly on STM32: great! My point is that this might not be the same experience for all devices/vendors. For example ROM bootloader code might affect or change the interrupt priorities or have interrupts enabled causing some side effects. > For example ROM bootloader code might affect or change the interrupt priorities or have interrupts enabled causing some side effects. I have no idea what you’re talking about. How can disabling interrupts in a completely freestanding firmware have any effect on you? If you’re booted into the bootloader, there’s little you can do except flash code and exit to reset into another boot mode (e.g. execute from RAM or Flash). 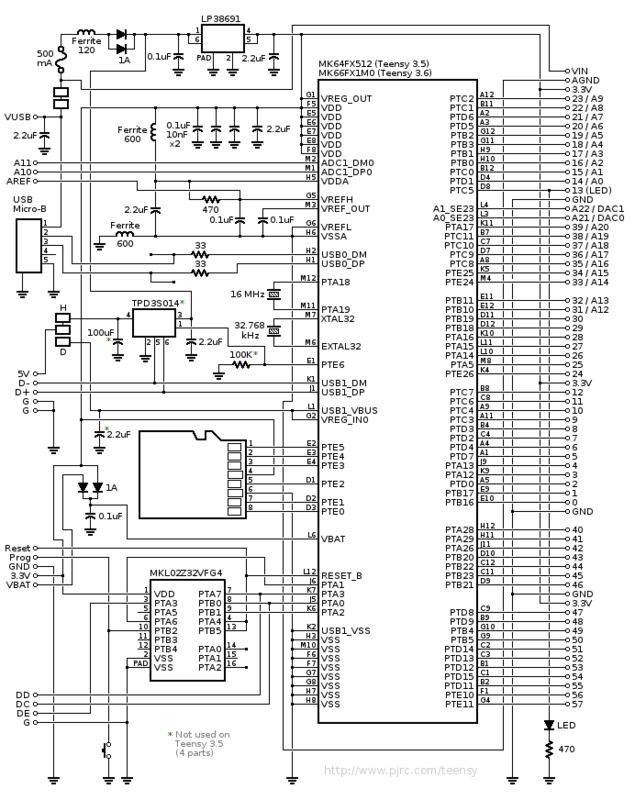 The bootloader has complete and exclusive control over the MCU and all of its peripherals. Whether it uses polling, interrupts, DMA or random GPIO bitbanging to do its job is completely irrelevant.